The great thing about ShortStack’s users is that you’re continually providing us with feedback on how we can make the platform better fit your needs. Today we’re excited to tell you about some of our most recent updates — suggested by you! Some of our favorites include the ability to copy and paste widgets (or containers of widgets) from one Campaign to another, the option to perform bulk edits to Widgets and Campaigns, and a few enhancements to our sharing capabilities. Here’s a closer look at the recent upgrades we’ve made to ShortStack. If you build multiple Campaigns, you’re going to love this new feature. We now support bulk actions within the Campaign and Form/Entries Manager views. This means users can tag and delete their Campaigns, assets, forms and templates in batches. In addition, ShortStack’s forms will support bulk copy and you can bulk copy/paste your Campaigns and Templates. To bulk edit your Campaigns simply use the check box’s located to the left of each Campaign in the Campaigns and Forms/Entries Managers. Select the Campaigns you want to edit and choose from the Action’s dropdown. We’re speeding up the process of getting media from your computer and other browser windows straight into your Campaigns by adding drag and drop capabilities. Users can now drag and drop images straight from other browser windows or other websites directly into ShortStack’s media manager. Once dropped, it will automatically upload and create an image widget. If you’ve ever created a Campaign and wished you could copy some of its best aspects to a new Campaign, your wishes have now come true! Using ShortStack’s icons or your computer’s hot keys you can copy and paste widgets or containers of widgets from one Campaign to another. Select the widgets you wish to copy, then click the copy icon. Open any other Campaign and click the paste icon. You can also choose where your widgets will go by selecting the widget you want the new widgets pasted after. ShortStack’s Share Widget is a powerful tool that allows Campaigns to reach a larger audience. We made two significant updates to our Share Widget, starting with the ability to add per-platform title, description, and link color configuration. This makes it easier for you to customize what your fans see based on the social network that is being shared to/from. When you set up your Share Widget if there are any errors we’ve made those easier for you (the builder) to find. The widget will now highlight each platform that has a validation error so you can easily correct the error and continue building your Campaign. Public Templates are pre-made campaign designs that make it easy to start your build. ShortStack has more than 70 templates that businesses can choose from to easily jump-start their Campaign. To access the public template gallery click on the “Public Templates” button under the Templates category. Last month we announced upgrades to our embed codes to include a responsive option for mobile visitors. 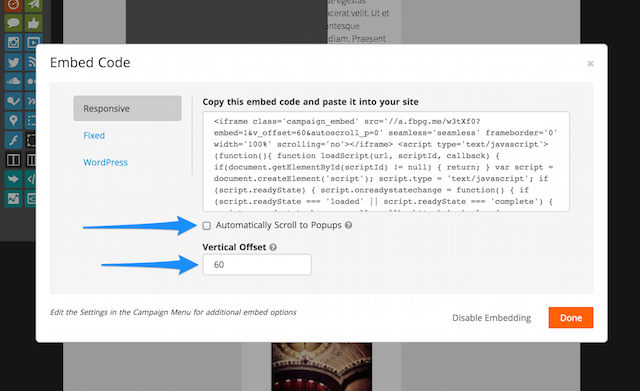 We’re continuing to enhance this feature by adding additional settings for embedding Campaigns. The first setting is the ability to select “automatically scroll to Popups.” Check the Automatically Scroll to Popups box to scroll to popups when visitors access them. We’ve also added a Vertical Offset setting which enables the ability to adjust scrolling. Many sites are using CSS and styles that include banners, menus, and navigation areas that take up space at the top of the page. In these cases, the browser has a hard time figuring out exactly where to scroll, and the Campaign might scroll to the wrong position. Adding an offset allows you to adjust for the extra height that a navigation bar might add to the page. Sometimes the internet can be spammy, and sometimes those spammers end up republishing a link to a Campaign and garnering fake entries. We don’t want to see this happen any more than you, so we’ve added an option in Campaign Settings for users to add domains to a “blacklist.” This will help reduce the number of entries from people who clicked on links from contest-aggregated sites. When a site is on the blacklist, visitors will see a Page Unavailable when they visit your Campaign from the spammy site. The best way to see how something looks or will work for you is to give it a try. That’s why our free users may now test ShortStack’s external embed feature. Users will be able to embed their Campaign on their website (the Campaign will include a ShortStack logo). In addition, we’ve added embed capabilities to the list of features for our ShortStack users. If you find yourself ready to build an awesome Campaign in ShortStack but you’re lacking time, coding skills or just resources to get it done, we want to help you! We’ve made it easy to talk to a representative about having a ShortStack designer build your Campaign by adding a link to our designer services right in the Campaign Manager. A variety of ShortStack users are taking advantage of our WordPress Plugin. We’ve made it so that this plugin now supports responsive embedding so that you don’t leave your mobile users behind. That’s it for this round-up of new features. To see other features we’ve recently added, click here. As always, please send us your feature requests to theteam@shortstacklab.com.